It was October 5, 1984 just a little after 7 a.m. ET when the Space Shuttle Challenger lifted off the pad from south Florida. 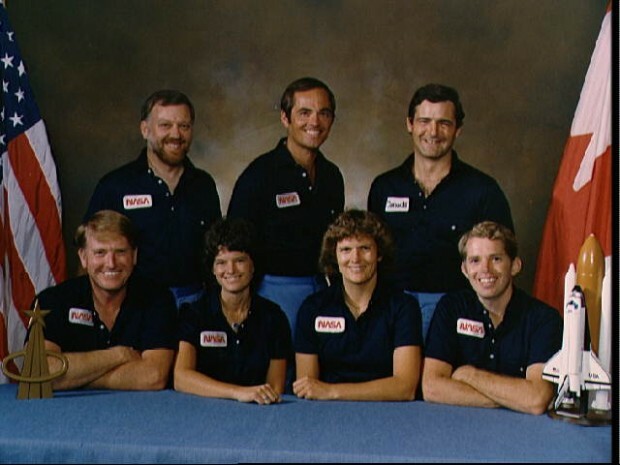 On board were Jon A. McBride, pilot; mission specialists Sally K. Ride, Kathryn D. Sullivan, and David C. Leestma; payload specialists Paul D. Scully-Power and Marc Garneau and crew commander Robert L. Crippen. 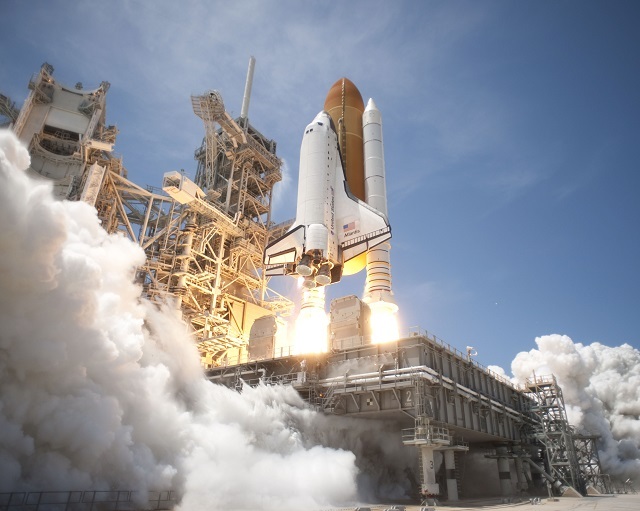 NASA, not having figured out a sensible numbering system for shuttle flights yet, called the mission 41-G — but this was actually the 13th space shuttle flight. Up here in the north though, it was simply the first mission that carried a Canadian into the final frontier. 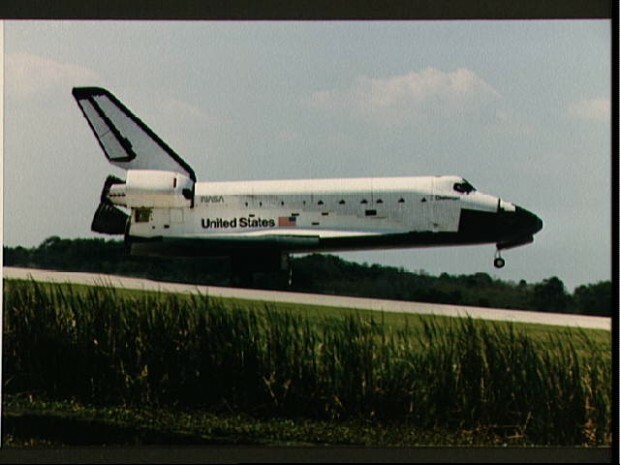 But that wasn’t the only first for STS-41-G. It was also the first shuttle flight with a crew of seven; it was the first flight with two women on board; it was the first flight where a spacewalk would be conducted by a woman (Sullivan). STS-41-G was Sally Ride’s second and last spaceflight. During the course of the eight day mission (they landed October 13), Garneau was responsible for conducting 10 science experiments on board. He also assisted with general house keeping duties, such as preparing meals. Garneau was on board representing the National Research Council of Canada – which at the time made the Canadian astronaut selections – since the Canadian Space Agency did not yet exist (the CSA was founded March 1, 1989). 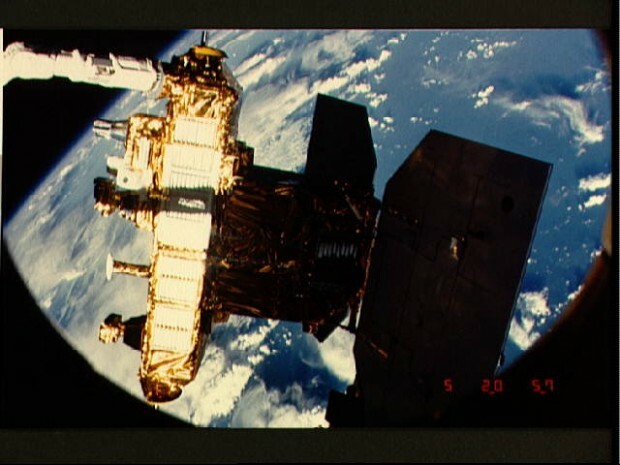 Garneau’s backup for the mission was fellow Canadian astronaut Dr. Bob Thirsk, who flew into space on STS-78 (1996) and as part of the Expedition 20/21 (2009) crew to the International Space Station. 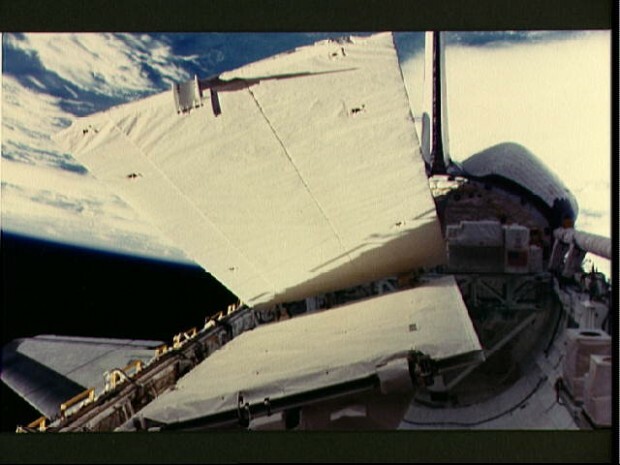 Besides STS-41-G, Garneau also flew into space on STS-77 (1996) and STS-97 (2000). Over the course of STS-41-G, Challenger completed 133 orbits covering some five million kilometers. The photos below all courtesy NASA/JSC. Portrait view of STS 41-G crew in civilian clothes. Bottom row (l.-r.) Payload specialists Marc Garneau and Paul Scully-Power, crew commander Robert Crippen. 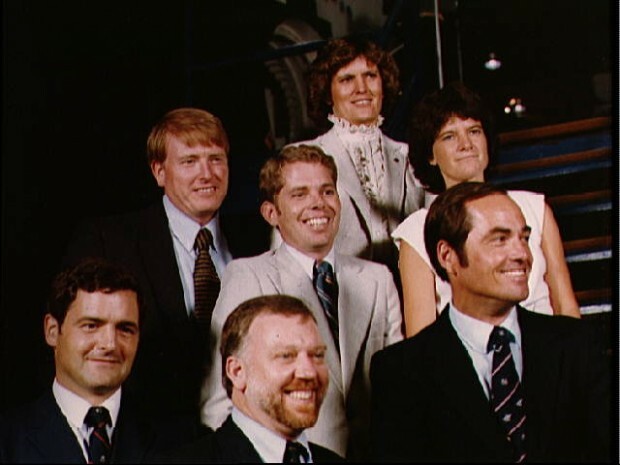 Second row (l-.r-) Pilot Jon McBride, and Mission Specialists David Leestma and Sally Ride. At very top is Mission Specialist Kathryn Sullivan. 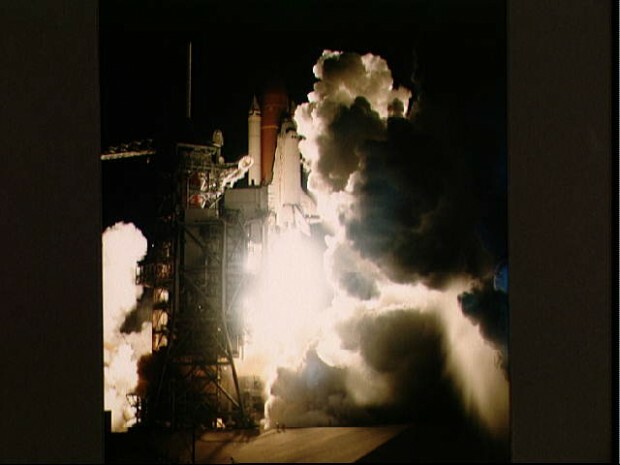 View of the early morning launch of STS 41-G Challenger. The dark launch complex is illuminated by spotlights as the orbiter begins its ascent from the pad. The light is reflected off the clouds of smoke from the orbiter’s engines. 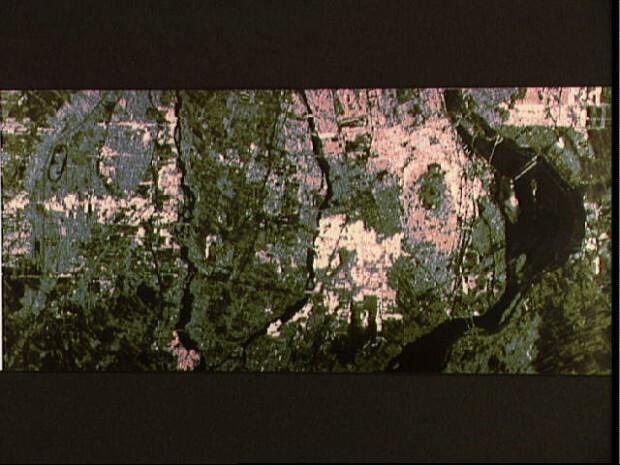 False-color image showing Montreal, Quebec, Canada, and was acquired by the Shuttle Imaging Radar-B (SIR-B) during STS 41-G. The St. lawrence River dominates the right portion of the photo. Several bridges cossing the river are visible. Pink and blue areas are generally buildings or pavement. Light green areas regions of natural vegetation; darker green areas are generally cultivated regions. A race track like structure is apparent at top left. The Riviere des Milles Illes and the Riviere des Prairies (left and right, respectively), join to form a U-shaped waterway at the center of the image. The large elliptical green-centered feature west of the St. Lawrence is Mt. Royal. 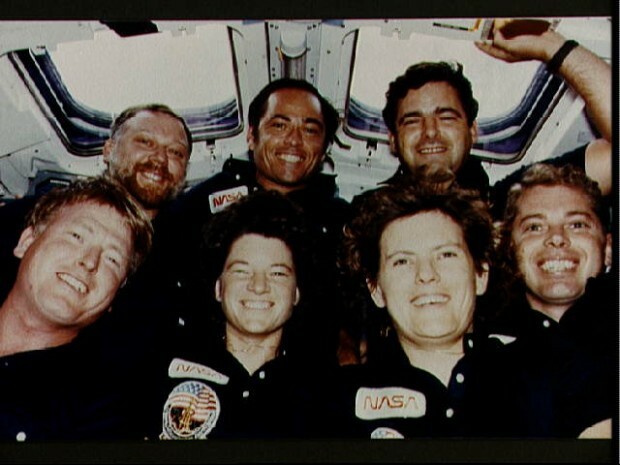 STS 41-G crew photo taken on the flight deck of the Challenger during the flight. Front row (l.-r.) Jon A. McBride, pilot; Sally K. RIde, Kathryn D. SUllivan and David C. Leestma, all mission specialists. Back row (l.-r.) Paul D. Scully-Power, payload specialist; Robert L. Crippen, crew commander; and Marc Garneau, payload specialist. Garneau represents the National Research Council of Canada and Scully-Power is a civilian oceanographer with the U.S. Navy. 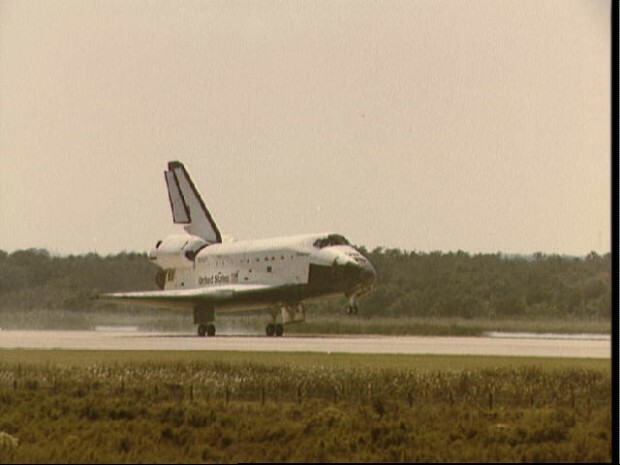 The Space Shuttle Challenger lands at Kennedy Space Center (KSC) at the end of the STS 41-G mission. 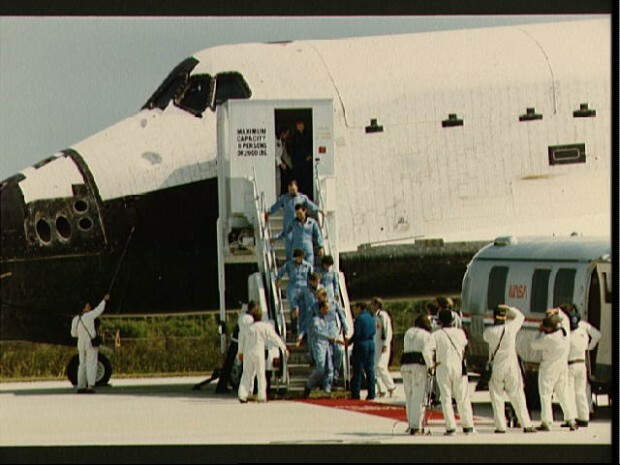 STS 41-G crew leaves the orbiter after landing at Kennedy Space Center at the end of their mission. Astronaut Robert Crippen shakes hands with George W.S. Abbey, Director of JSC’s Flight Crew Operations, while the other crewmembers wait behind him. They are Jon McBride, David Leestma, Sally K. Ride, Kathryn Sullivan, Marc Garneau and Paul Scully-Power. Reprising his role from “Good Morning Vietnam”, Robin Williams made the inaugural wake-up call to the Space Shuttle Discovery in 1988 during the mission STS-26. Williams’ wake-up call was the first of the mission, and the flight was the first space shuttle flight since Challenger exploded during launch in 1986. In the video of the wake-up call from NASA, flight controllers can be seen laughing along with the recording from Williams. “Gooooood morning Discovery! Rise and shine, boys. Time to start doing that shuttle shuffle. You know what I mean. Hey, here’s a little song coming from the billions of us to the five of you,” Williams is heard saying. Williams died on August 11 after an apparent suicide. 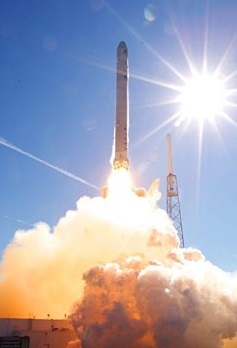 I had the good fortune to be able to watch a Shuttle launch first hand in May 2010. I went down to Florida with a good friend to take in the Space Shuttle Atlantis launch on STS-132. At this point the shuttle program was winding down, and we decided being able to see one was a ‘now or never’ sort of thing. On May 14, just before 2:30pm Atlantis roared to life. As anyone who has seen a launch, or pictures of it, you know how it looks. And having watched many on TV, I had an idea what to expect visually. What I was completely unprepared for was the feeling of it. We saw the light, the flames, the orbiter jumping off the pad, and then a few seconds later came the sound. But this wasn’t just sound that you heard; this was sound that you felt. Even at a distance of about 10 miles (16km) where we were watching from, you could feel the rumble. You could feel the wind moving past you. The excitement I felt, even vicariously, for the six crewmembers riding that rocket was incredible. Thinking about how I would have felt if that amazing machine had exploded before my eyes is hard to imagine. But on January 28, 1986 that is precisely what happened. Exactly 73 seconds after launch, the Space Shuttle Challenger blew up. All seven crew were lost as the television cameras rolled: Francis R. Scobee, Michael J. Smith, Ronald McNair, Ellison Onizuka, Judith Resnik, Greg Jarvis, and Christa McAuliffe. As it turns out, that rocket ride is only a semi-controlled explosion. And on this day, the ‘semi-controlled’ was not in the crew’s favour. The dangers were, either intentionally or not, under-estimated – and perhaps not even fully understood. We have of course since learned what caused the explosion from a technical perspective: a faulty O-ring that couldn’t perform correctly in cold weather. Though ultimately it was a human failure. People knew the O-ring wasn’t designed to operate in cold temperatures, but due to complacency the decision was made to proceed anyway. But in retrospect, one of the most amazing things happened following that: an incredible culture shift took place at NASA that removed much of the bureaucratic decision making and replaced it with evidence-based decision making. That made this incredibly dangerous job just a little bit safer. But with so much on the line, ‘just a little bit’ can account for a lot. The Challenger disaster also made people look inward and wonder how to move forward. There were calls to cancel the Shuttle program. Ultimately, and positively in my opinion (say what you will about the overall success of the Shuttle program) the decision was to build a legacy for those seven astronauts. Because in the end space exploration is a dangerous job. We’re fooling ourselves if we thought that no life would ever be lost on a flight into space. We’re still fooling ourselves if we think it will never happen again. It will – and indeed did happen again, when the Shuttle Columbia was lost along with her crew in February 2003. But we can learn lessons from the past to make sure we’re being honest with ourselves – and the people flying the missions – about what the chances of failure are. And so we continue to explore space. There is a space station the size of a football field that flies 400km over our heads. There is international cooperation that has brought together bitter enemies. Our desire for exploration continues and our gaze now looks even deeper into space, to places like Mars. These missions though are built upon the shoulders of Challenger, and the most important lesson we ever learned –albeit the hard way: we will never again be complacent. Our nation is indeed fortunate that we can still draw on an immense reservoir of courage, character, and fortitude, that we are still blessed with heroes like those of the Space Shuttle Challenger. Man will continue his conquest of space. To reach out for new goals and ever-greater achievements, that is the way we shall commemorate our seven Challenger heroes. All of a sudden, space isn’t friendly. All of a sudden, it’s a place where people can die. . . . Many more people are going to die. But we can’t explore space if the requirement is that there be no casualties; we can’t do anything if the requirement is that there be no casualties. — Isaac Asimov, regards the Challenger investigation, on CBS television show 48 Hours, April 21, 1988. — Bryan O’Connor, NASA deputy associate administrator Space Shuttle, interview in Space News, January, 10 1996. — Henry Joy McCracken, LM, November 1997. Anyone who knows me in person or online knows that when there is a rocket launch, I get excited. I watch the launches. I tweet along. I post and share videos of them. I even flew to Florida once with a good friend to take in a Shuttle launch (Orbiter Atlantis on STS-132 in May 2010). I watched with great interest last week when an Antares rocket blasted off to the International Space Station with the new Cygnus vessel. I kept a very close eye yesterday as a Soyuz soared into space with three new astronauts, also bound for humanity’s most distant outpost. But following such things so closely puts me in a small – perhaps a very small – minority. Is this because the majority of people don’t care about spaceflight and exploration? Looking at recent missions that got significant attention, we don’t have to go too far back: Canadian astronaut Chris Hadfield garnered significant attention from fans, on social media, and even in the mainstream media during his stay on the International Space Station. Ditto NASA’s Mars Science Laboratory, aka Curiosity, when it landed on Mars in August 2012. People all over the world are passionate about spaceflight, exploration, and discovery. People are interested when special things happen. And that last sentence is the crux of why people don’t pay attention to spaceflight. Spaceflight isn’t seen as “special” – it’s considered routine. And routine things don’t make the news or become the topics of water cooler conversations in your office. Now for the scientists, engineers, mission planners, astronauts, administrators, and everyone else involved in putting spaceflight together this is a good thing. The fact that the public sees spaceflight as routine is a credit to just how good they are at their jobs. They’re so good, executing consistently with such a high degree of precision, that they are able to make exceptionally difficult tasks appear easy. But there is a downside to this excellence: public apathy to what are, in reality, incredible feats. Every time a rocket launches there are millions of things that could go wrong. Any one of those things could jeopardize the mission – and perhaps endanger lives. But the public has come to (correctly) expect that nothing will go wrong. They expect to hear in passing that there was another successful launch and humanity’s exploration of space continues. Next story. The public is taking spaceflight for granted. But this is not a wise state of mind. Spaceflight is incredibly challenging to achieve – and when success is taken for granted people become careless. Limits are pushed. Things go wrong. People close to missions know this. They work hard to stay focused to ensure everything works perfectly, every time. I submit, humbly, that the public should remember this as well. There is nothing routine about spaceflight, and a couple minutes on the evening news or a few minutes of discussion around the water cooler would be a valuable nod to all the people who have worked so very hard to make it look so very easy.